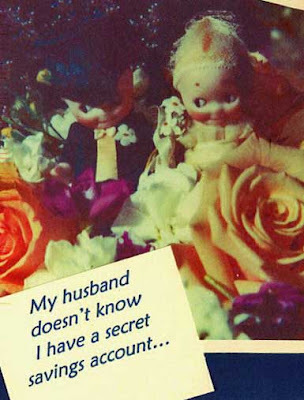 This Post Secret bothered me. The implication is that either the woman is saving up to leave her husband (a la soap opera) or just doesn't trust him to manage their finances. Seldom is the wife saving to buy her husband a shiny new car (like in Medium). Growing up my dad handled all of our finances. My mom signed over her check and large purchases were decided on together. He was in charge of clothing and grocery shopping. On the flip side I had an aunt and uncle who split household bills and individually managed any leftover money. This worked out for me because every holiday brought two gifts from that household! My happy medium would be very similar to j. money's post. I think couples should contribute to major home bills but still maintain personal accounts. Financial autonomy is important even within a partnership. Hi there-totally agree with your sentiments here! When I lived with a boyfriend several years ago, we had our own bank accounts and were responsible for individual bills (ie, he'd pay power and I'd pay phone) that added up to an equal amount for each of us. He did handle rent because I was always (and still am) bad about saving up that much money each month, so I'd give him my weekly share after getting paid each Friday and he'd pay the whole thing on the 1st. Wish I had someone to do that for me now with my mortgage!